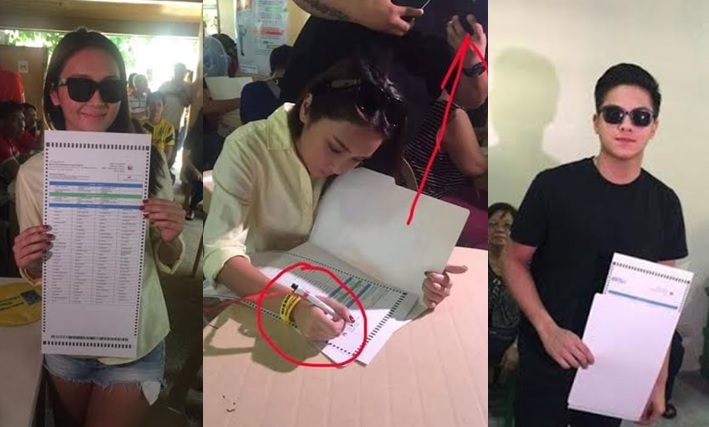 MANILA, Philippines- Commission on Elections (Comelec) spokesperson James Jimenez said that he wants to talk with Kapamilya love team Daniel Padilla and Kathryn Bernardo (KathNiel) after photos with their ballots spread like wildfire on social media. Comelec wants to have dialogue with Daniel Padilla, Kathryn Bernardo after photos with ballots circulated online. “For those who willingly and obviously, very openly displayed their ballot, we need to talk,” Jimenez said in his interview with PhilStar. Padilla and Bernardo’s photos showing off their unfilled ballots caused online uproar after showbiz reporter Gretchen Fullido shared them on ABS-CBN News social media sites. Netizens have accused the teen king and queen of violating the Comelec rule against taking selfies or photos inside poll places. Under Comelec’s rule, voters, watchers and members of the Board of Inspectors (BEIs) are prohibited from taking photos of their ballots and voter’s receipts inside polling precincts on May 9 since this violates the secrecy and sanctity of the ballot. However, citizens may reveal who they voted for on social networking sites since it is not prohibited to reveal the names of the candidates they picked. Those who will be found guilty can face up to 6 years of imprisonment. “As a voter, you can bring a phone with a camera inside the polling place but you cannot use it. As a watcher, you can bring a camera and use it, provided it does not violate the sanctity of the ballot, meaning you cannot take a photo of your official ballot or the voter’s receipt,” Mandaue City Election Officer Ferdinand Gujilde said. It was not clarified whether journalists or members of the media like Fullido are exempt from Comelec’s rule. Moreover, Bernardo, a known supporter of Roxas-Robredo tandem, was also seen wearing a RoRo baller while voting. Former Comelec commissioner Gregorio Larrazabal pointed out that the baller is a campaign material, which is not allowed to be used inside the precinct.